Violent but subtly humorous, action filled but occasionally thoughtful, and creative look at a near future ultra secret hotel-hospital for wealthy criminals run by an aging, no-nonsense, rough but surprisingly compassionate and maternal Nurse and her massive orderly, during a perfect storm of chaos. This is an adult only movie to be sure. Though there is almost no sexuality of any kind, there is a LOT of violence and a large dose of bad language. NOT for kids. There may be no honor among thieves but at the Hotel Artemis there is at least some loyalty. 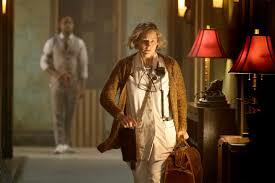 The Hotel Artemis is a 22 year old run-down member-only hospital for criminals. On the 12th floor of a building in the wrong part of Los Angeles, it is exclusive, hidden and generally thought to be a myth. 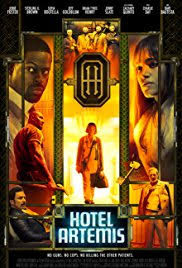 Hotel Artemis is an indie movie, written and directed by Drew Pierce whose credits as writer include Iron Man 3, Mission Impossible: Rogue Nation and 2020's future new Downey, Jr. Sherlock Holmes. This is his first outing directing a feature length film. 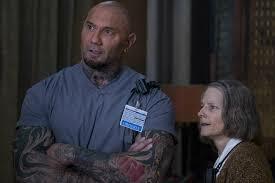 Her only staff – part orderly part bouncer – is Dave Bautista's character, Everest, whose name is a mystery only to people who have never seen a picture of this man mountain. His strong arm but restrained hand is somehow both scary and adorable. 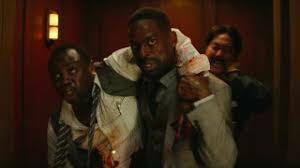 Early on, for example, he is jumped from behind by a customer who has been turned away. Shrugging him off as a bear might an overzealous cub he cautions him with the zen calm of an experienced camp counselor not to do it again or he just might have to really [mess] him up. Everyone goes by a nickname gleaned from either their job description or the hotel room name and Foster's lead character, The Nurse, is no exception. The movie is about the night of the Nurse's Perfect Storm. A city wide riot, like a slow-moving wildfire, is heading their way at the same time the Artemis' owner and founder, a mob kingpin named The Wolf King/Niagra, in yet another flamboyant bad guy role played by Jeff Goldblum, enters late in the evening for ministrations, accompanied by his overeager to please son, (Star Trek's Zachery Quinto), and his gang of thugs. Caught in the crossfire are a pair of brothers freshly injured from a bank robbery Waikiki and Honolulu, (Sterling Brown and Brian Henry), a munitions dealer, Acapulco (Charlie Day) who came off the worse for wear in an altercation with a mistress, and a mysterious hit woman, Nice, played by Sophia Boutella, whose true allegiances and hidden agenda slowly unfold as the evening wears on. 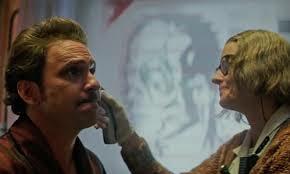 I have not cared much for the one note characters Boutella played in Kingsmen and Atomic Blonde, but her Nice in Hotel Artemis has her growing on me. The ensuing tornado of violence will expose formerly unknown histories and secrets central to the souls of these eminently interesting characters. 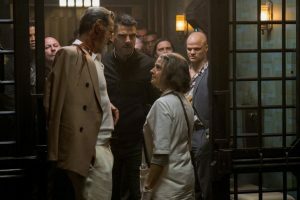 There are many rules for the Hotel Artemis. Among them are: no weapons allowed, no one but members through the gates, do not insult or threaten the staff, and …….. do not kill the other patients. For one reason or another all the rules will be broken this night …. for better or for worse. The violence is considerable and the language is fairly raw but there is no sexuality. Who has time with the amount of fighting and blood shed that will go on? Foster is the genuine article. An actor, like Dustin Hoffman, who does not shy away from looking truly ugly. But from Foster's Nurse, underneath her worn exterior, shines a beauty of genuine but rough and no-nonsense affection for her patients. She exercises an unsentimental, tough-love maternal protective fiduciary duty towards them all and it makes her character both endearing and relatable in ways that more glamorous but despicable women in movies like Ocean's 8, can not even begin to evoke. If honesty and genuine concern were coinage she would be the richest woman in this movie about a medical retreat for the super wealthy criminal. 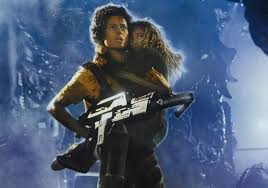 I haven't seen this kind of unique perspective on the maternal instinct since Ripley's square off with the mother creature in Aliens. This is an unusual and creative movie. I believe it has been vastly underrated by the traditional reviewing community, more particularly Rex Reed who labeled it as a shoddy freak show. This is grossly unfair and I suspect he did not understand its themes of filial duty and responsible altruism, which the writer is asserting is a potential which lies at the core of every human soul, even the apparently mosty fallen ones among us. The characters are three dimensional and behave in often unexpected but very credible ways. They are somewhat larger than life (especially Bautista) but there are genuine and unique personalities which come out clearly in small ways and clever dialogue. No exceptions or excuses are made for their criminal behavior but there is a humanity to them which make them very accessible. And, Hallelujah, Hotel Artemis does not always take itself completely seriously. Goldblum's character is aware that he is a very bad guy and likely to come to a very bad end. Baustista's character knows he is massive and almost unstoppable but has a gentle and fiercely protective spot for this tiny fragile elderly and essentially kind maternal Nurse. 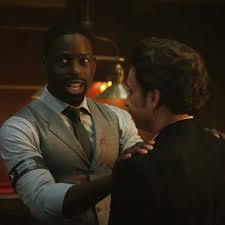 Right after Waikiki warns an especially obnoxious fellow patient, Acapulco, that Nice could kill him with a coffee cup she immediately demonstrates, then warns Acapulco that it is a good thing the Hotel Artemis has its rules. Nice advises someone on how to die well: "They paid for your death, don't give them your dignity for free." 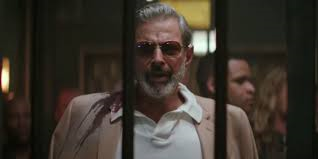 And if you're the kind of movie attendee who likes to stay for the credits, the last line is: "The staff of the Hotel Artemis hopes you enjoyed your stay and that you will come again." One has to smile. 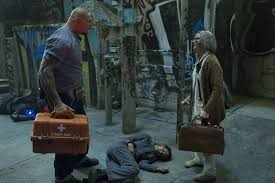 Certainly not a family friendly film, but for those of appropriate age and disposition, Hotel Artemis is more than worth your time. Next Next post: OCEAN’S 8: THE EMPRESSES HAVE NO CLOTHES: DESPITE ALL THE PRAISE, IT IS A BAD MOVIE. HERE’S WHY.